Inside Our Minds is excited to announce our first Radical Mental Health Week – October 7-13th. 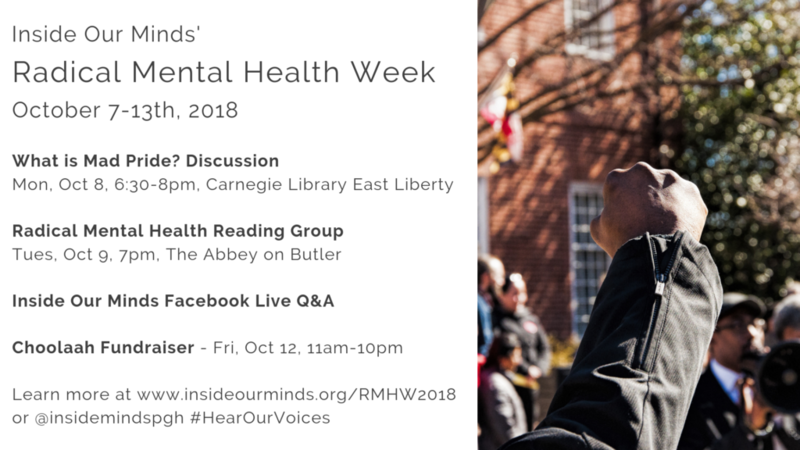 Radical Mental Health Week will feature both in-person and online events geared toward education and open discussion of radical mental health, Mad Pride, Neurodiversity, and other perspectives outside the current mental health community. As always, our events are open to everyone, including all perspectives on mental health, mental illness, and madness. What is Mad Pride? (Monday, October 8th from 6:30-8pm at the Carnegie Library East Liberty) – We’ve had a lot of supporters ask what the word “madness” means, as it is included in our mission statement. Is it stigmatizing? Why does anyone chose that label? Why should I be inclusive of Mad-identified individuals? For this event, we want to create a space for the open discussion of madness and Mad Pride for those who are unfamiliar with the term, as well as people who identify as Mad, Crazy, or another reclaimed term. Radical Mental Health Reading Group Launch (Tuesday, October 9th at 7pm at The Abbey) – The Radical Mental Health Reading Group will be a recurring informal discussion on different texts in radical mental health / Mad Pride / CSX. This is a great event if you’d like to learn more about radical mental health and/or discuss your thoughts with other members of the community! Our first reading will be “Mindful Occupation: Rising Up Without Burning Out” – available for free online, or purchase the zine from Microcosm Publishing. Inside Our Minds Q&A (TBD) – Facebook live event for anyone who has questions about Inside Our Minds for our team (our organization, our programs, etc). Inside Our Minds Fundraiser at Choolaah (Friday, October 12th, 11am-10pm) – Choolaah is dedicating an entire day to Inside Our Minds! For each guest that mentions Inside Our Minds on Friday, October 12th, Choolaah will donate 30% of the purchase to us! #HearOurVoices – Continuing our #HearOurVoices campaign that allows people to share their perspectives on being outside the current mental health system. Anonymous or public options. Stay tuned for announcements on event dates and more events!